The Southwest Monsoon could not advance further since last one week due to weak monsoon flow in associations with (a) weak cross equatorial flow (ii) Unfavorable location of active phase of Madden Julian Oscillation (MJO) (iii) an equatorial eastwards propagating oscillations which lay over central & east Pacific Ocean, Western Hemisphere and Africa and (iv) development of low pressure system over northwest pacific Ocean. However, the monsoon circulation is likely to improve from around 24th June with (i) expected movement of active phase of Madden Julian Oscillation (MJO) to west Equatorial Indian Ocean and adjoining Arabian Sea during next 2­-3 days and (ii) development of cyclonic circulations over eastern India leading to strengthening of easterlies winds over Gangetic plains. 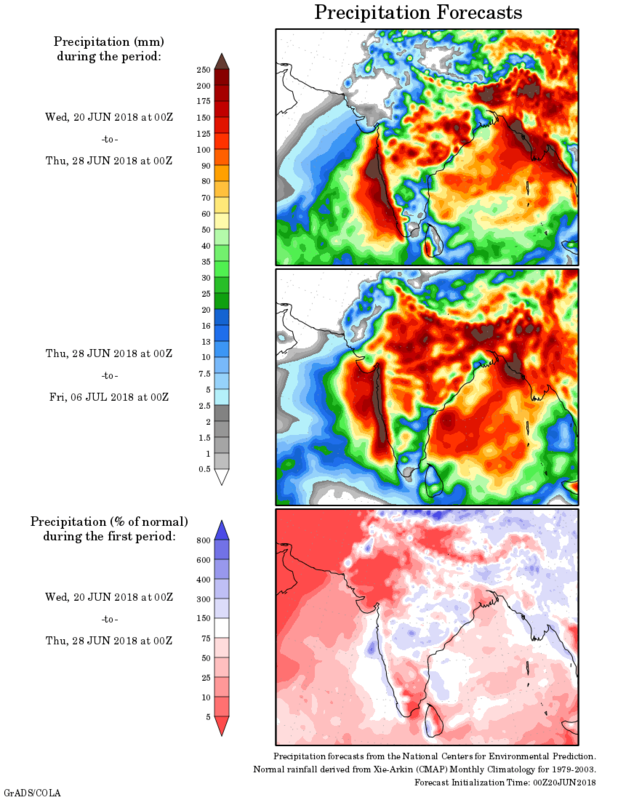 As a result, the Southwest Monsoon is likely to further advance over remaining parts of Assam, some more parts of Maharashtra, Chhattisgarh, Odisha, West Bengal and some parts of Jharkhand, Bihar and Madhya Pradesh between 23rd to 25th June. The Northern Limit of Monsoon continues to pass through Lat. 19°N/Long. 60°E, Lat. 19°N/Long. 70°E, Thane (including Mumbai), Ahmednagar, Buldhana, Amravati, Gondia, Titlagarh, Cuttack, Midnapore, Lat. 24°N/Long. 89°E, Goalpara, Baghdogra and Lat. 27°N/Long. 87°E. ઓફશોર ટ્રફ કોંકણ થી કેરળ સુધી સી લેવલ ઉપર છે. એક યુએસી દક્ષિણ કોંકણ/ગોવા આસપાસ છે જે 4.5 કિમિ ની ઊંચાઈ સુધી ફેલાયેલ છે. 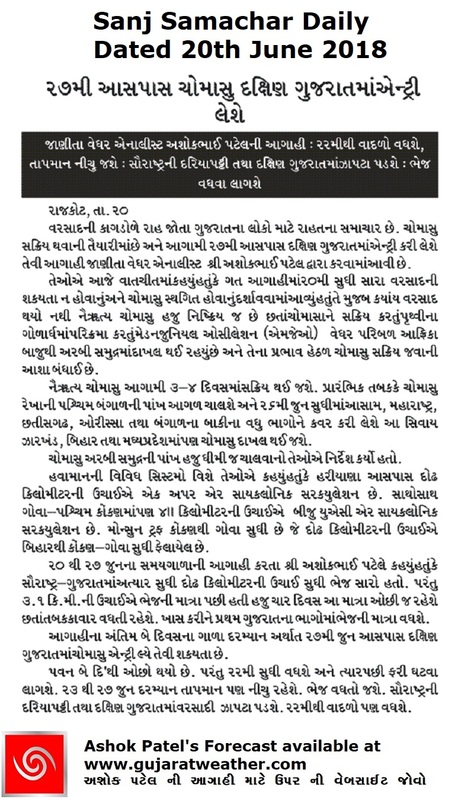 એક યુએસી 0.75 કિમિ ની ઊંચાઈ સુધી બિહાર આસપાસ છે. બિહાર થી એક ટ્રફ 1.5 ની ઊંચાઈ સુધી છે જે કોંકણ/ગોવા વાળા યુએસી સુધી લંબાય છે (વાયા છત્તીસગઢ ), જેમાં બિહાર વાળું યુએસી પણ બૂડ છે. એક યુએસી હરિયાણા આસપાસ છે જે 1.5 કિમિ ની ઉંચાઇ સુધીછે. 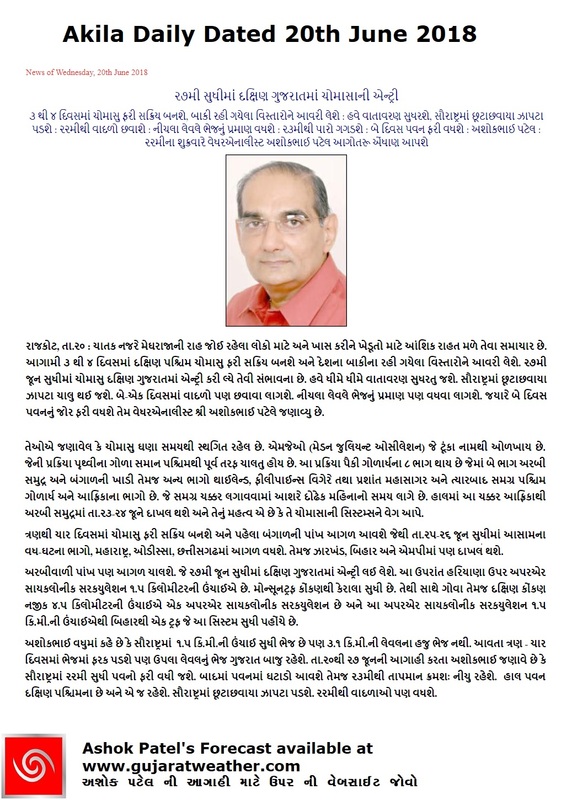 પવન દક્ષિણ પશ્ચિમ ના છે. પવન થોડો ઓછો થયો છે આગળ દિવસો કરતા પવન ફરી 22 સુધી વધુ રહેશે.તારીખ 23 થી 27માં પવન ફરી ઓછો રહેશે. મહત્તમ તાપમાન હાલ છે તેનાથી તારીખ 23 થી ઘટશે। વાદળો 22 થી થશે અને આગાહી સમય માં રહેશે. દક્ષિણ ગુજરાત, મધ્ય ગુજરાત, સૌરાષ્ટ્ર અને કચ્છ માં છુટા છવાયા ઝાપટા /હળવો વરસાદ મુખ્યત્વે આગાહી ના પાછળ ગાળા માં. દક્ષિણ ગુજરાત માં મધ્યમ વરસાદ સુધી ની શક્યતા પાછળ દિવસો માં અને 27 જૂન સુધી માં ચોમાસુ દક્ષિણ ગુજરાત માં એન્ટર થવાની શક્યતા છે. બીજા વિસ્તારો માં નોંધપાત્ર વરસાદ ની શક્યતા ઓછી. ભેજ 3.1 કિમિ માં ઓછો છે જે ગુજરાત બાજુ પહેલા વધશે અને ત્યાર બાદ સૌરાષ્ટ્ર બાજુ વધશે. દક્ષિણ પશ્ચિમ ચોમાસુ તારીખ 23 થી 26 દરમિયાન બાકી ના આસામ , મહારાષ્ટ્ર ના ભાગો , છતીશગઢ ઓડિશા પશ્ચિમ બંગાળ માં આગળ વધશે તેમજ ઝારખંડ, બિહાર અને એમપી ના ભાગો માં દાખલ થઇ આગળ ચાલશે. અરબી પાંખ એક બે દિવસ મોડી ચાલશે અને 27 સુધી માં દક્ષિણ ગુજરાત માં દાખલ થશે. The is an Off-shore Monsoon trough at sea level now runs along Konkan to Kerala Coast. The UAC over Madhya Maharashtra now lies over South Konkan/Goa and extends up to 4.5 km above mean sea level. There is a UAC over Bihar and neighboring East U.P. at 0.75 km above mean sea level. A trough runs from Bihar to the UAC along South Konkan/Goa at 1.5 km above mean sea level across Chhatishgarh, with the UAC over Bihar embedded in this trough. There is a UAC over Haryana and extends up to 1.5 km above mean sea level. Winds are mainly blowing from Southwest. 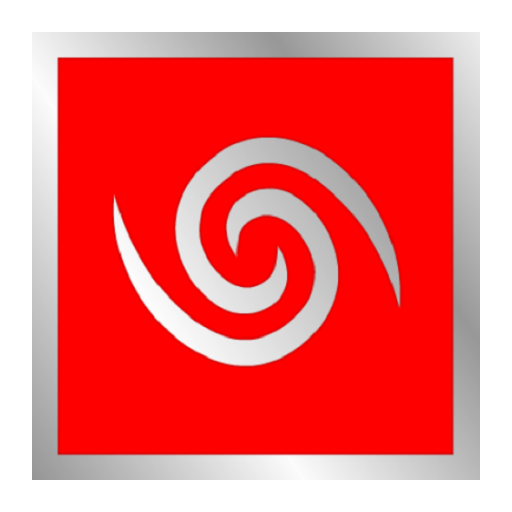 The wind speed has reduced compared to earlier few days. Southwest winds will increase again till 22nd June and winds will be lower speed from 23rd to 27th June compared to earlier period. The Maximum Temperature will decrease from 22nd June and will be much lower from 23rd to 27th June compared to earlier period. Scattered showers/light rain expected over South Gujarat, Central Gujarat, Saurashtra & Kutch mainly during later parts of forecast period. South Gujarat expected to receive higher quantum of medium rain during the latter parts of forecast period as Southwest Monsoon expected to enter South Gujarat by 27th June. Widespread meaningful rainfall possibility for other areas is limited during this period. Low level humidity is high, however the higher level (3.1 km above mean sea level) air is dry. The 3.1 km Humidity will increase during the latter parts of forecast period more towards Gujarat side compared to Saurashtra. Southwest Monsoon expected to Advance over remaining parts of Assam, some more parts of Maharashtra, Chhattisgarh, Odisha, West Bengal and enter over parts of Jharkhand, Bihar and Madhya Pradesh between 23rd to 26th June. The Arabian branch expected to move between 24th to 27th June.